← The Best Day Ever! I’ve got some good news to share with you. You see, a little over a year ago there was some serious mischief on my trails. 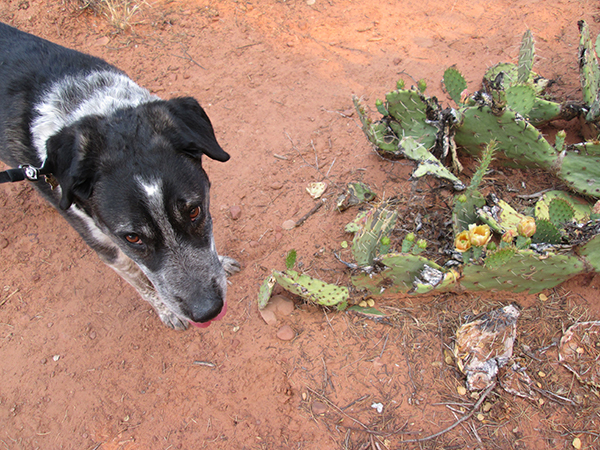 Someone had murdered some of my prickly pear cacti. If you want to know how terrible this crime was you can click on this link here. Ever since then I’ve been sad every time I walk by and see them. But those prickly pear are hardy. And they’re beginning to show signs of healing. They must have only been almost murdered. Because dead cacti don’t grow flowers. It’s like a miracle on my trails. And things have gotten even better. The injured prickly pear keep getting more flowers. 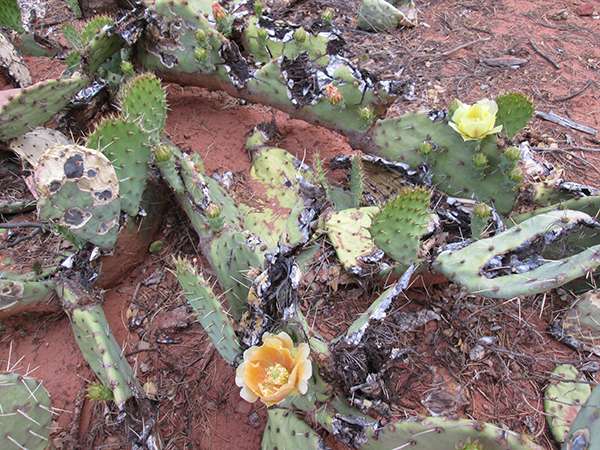 But please be careful around these prickly pear. they might shed a few flowers. That is sad. Maybe someone hit them with a stick. That was very nasty and naughtyof them. I expect it was children , they do naughty things like that.. but most plants are very strong especially those in desert areas..so it is good to see it coming back to life. if you ever find out who did it, you have my consent to bite their bums…. Patrecia, if I ever find out who hurt those cacti I’m giving them what for for sure. I think Mother Nature put on her DetectiveDog hat and fixed the mystery. They’re on their way back! Cupcake, that’s for sure. Mischievous people don’t win out in the end. Only mischievous dogs. Like a pheonix from the ashes these flowers emerge. Whee are glad to see they’re coming back! Pigs, those prickly pear are really tough. You can cut part of one off and plant it in hard, dry dirt and it will take root. Chancy and Mumsy, that’s a great philosophy of life. Keep on blooming. Hugs and nose kisses back to you. Marina, I’m sure they were happy to see me every time I walked by. That’s probably why they started blooming. Mother Nature is wonderful, just look at what she’s done – the prickly pear is very resilient and has come back to life with probably more floweers than before, so you can admire it again Bongo! Barbara, I guess Mother Nature is stronger than a bunch of cactus destroying hoodlums. I hope they learned not to mess with Mother Nature. Ahhh Mother Nature! You will persevere! Thanks Bongo! Marty, my trails always seem to hang in there. Yeah for the flowers. Can’t keep a good cactus down. That’s so true Dogdaz. Those cacti are tougher than nails. What a wonderful news it is Bongo! I’m so surprised to see their vital energies! Horray! Kevin, it’s amazing how those prickly pear bounce back. You can even cut part of one off, plant it in dry dirt, and it will take root. the flowers are beautiful Bongo, I know you are sending them to me. Woof! Fredrieka, of course they’re for you. You’ll have to enjoy the pictures though. If I try to pick them I might get pricklers from the cactus they’re attached to. Definitely at a distance. 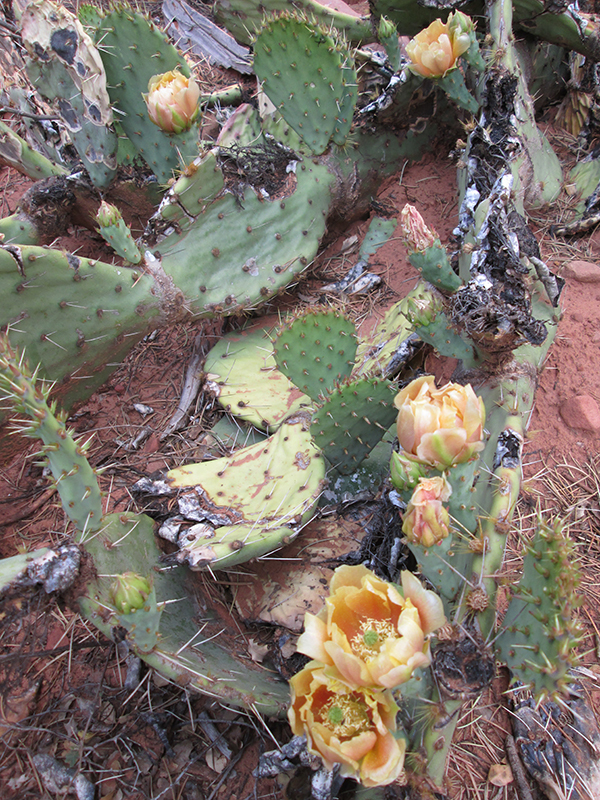 My person took lots of pictures of the prickly pear flowers on my trails and she got too close a couple of times. Thanks Dalton. You can’t knock down a cactus on my trails. Little Binky, those prickly pear cacti are really hardy.